Though we loaded up on the veggies, we didn't skip on the good stuff! Though we loaded up on the veggies, we didn't skip on the good stuff! Sweet potatoes and black beans are a match made in heaven. Add salsa and sour cream, plus some cheese, and I am one happy woman. 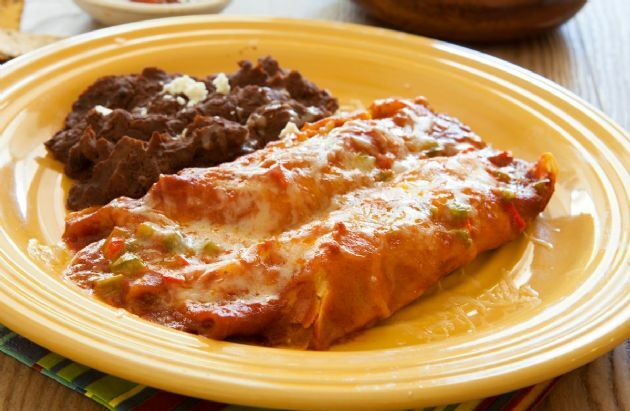 This dish came about because I wanted to make better-for-you enchiladas. This dish is high in fiber and full of protein, and it contains two servings of vegetables per serving. I shred the sweet potato using my food processor. You could use a box grater. You could also cut it into a small dice and cook it with the onion and garlic until almost tender. Spray a rectangular casserole pan with nonstick cooking spray. Place about 1/2 cup of vegetables on half of each tortilla, then place in casserole dish and fold the top over. Mix salsa and sour cream, then pour over the enchiladas, then sprinkle on the cheese. Bake for 25 minutes covered, then remove lid for remaining 5 minutes to allow cheese to fully melt.